This afternoon I am introducing my taste buds to sweet rosebud tea. I was given a small sample of this lovely organic tea by my friend Figen at Fig Botanicals in Somerville, NJ. First of all, can I just say, WOW?! The entire first floor of my house smells like I just got a surprise delivery of fresh roses and it’s not even my birthday! Secondly, how did I wait this long to drink rosebud tea?!! I feel like a pretty, pretty princess lounging in her boudoir or a fine lady enjoying a lavish high tea with her high society chums. In reality, I’m listening to ‘Dinosaur Train’ playing in the next room while typing a blog post. Hey, at least I’ve got some awesome tea to drink! I’m actually enjoying it iced today, since it’s so warm and humid. 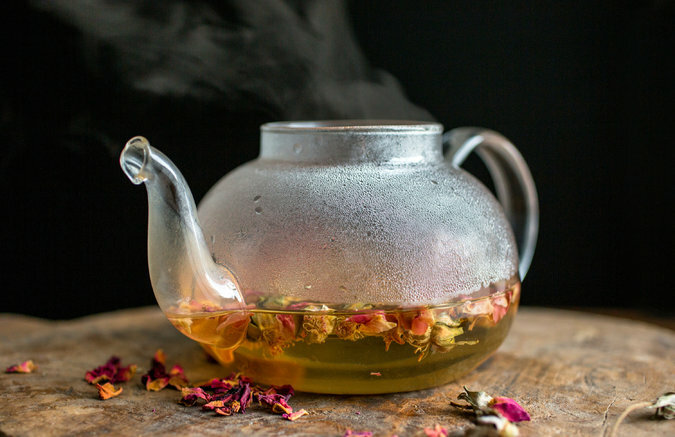 Not only is sweet rosebud tea sensationally aromatic, it is said to aid in mental clarity. I could sure use that right now with everything I’ve got going on in my life. Couldn’t you? If you’ve never sipped a lovely cup of lemon verbena tea, here’s a little nudge from your friendly neighborhood health coach. 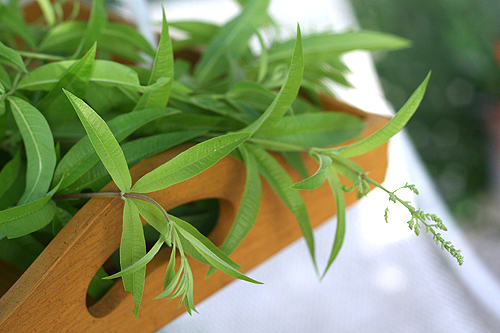 Lemon verbena is well known for it’s amazing sedative properties. It not only helps to encourage relaxation for your mind and spirit, but for your body as well. It does wonders for women suffering from the symptoms of PMS including cramps, indigestion and mood swings (ladies, you know the ones). Lemon verbena leaves are also a blessing if you suffer from chronic digestive distress such as IBS, Celiac Disease and even Crohn’s Disease. It soothes the digestive tract, just as it soothes our stressed out minds. It has a light refreshing lemony flavor which is wonderful in the spring and summer months and you can drink it hot or iced. I always seem to stumble upon nummy, refreshing drinks when I least expect it. This was a total stumble upon moment. About a week or two ago (I’ve been thinking of posting this for a while, but lost track of time. ), I was making my morning cup of hot water with lime juice and I took a little detour. The first odd turn was deciding to pour the hot water into a tall mason jar (to make it more portable) instead of my usual coffee mug. 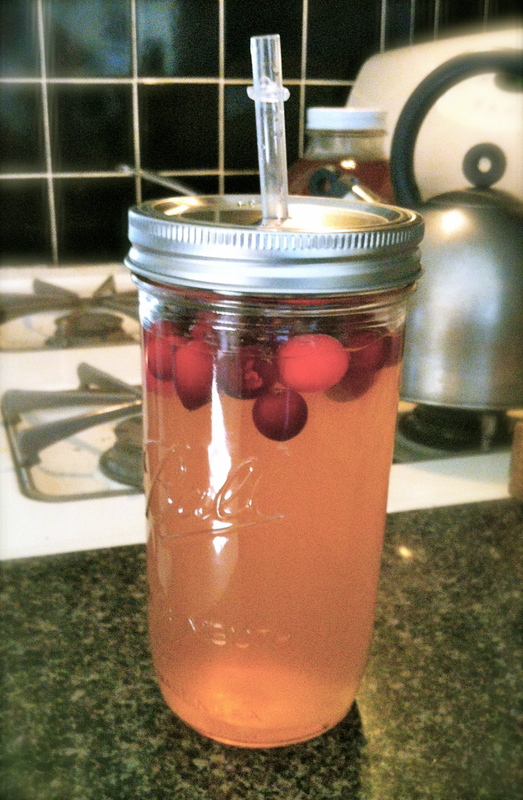 After adding the lime juice, I of course realized that the glass jar would be WAY to hot to handle, so I decided to add a couple handfuls of frozen cranberries to try to cool it off a bit. As I stirred and watched the pretty little red ribbons of color snake their way down the glass, I knew there was only one thing to do. So, I added about a teaspoon of maple syrup and Voila! Homemade pink limeade! Yes, I had to let it cool for a while before I could enjoy it, but it was worth the wait. What a great springtime refresher! Just a quick post to show off my pretty little smoothie that I made this afternoon. Not all green smoothies come out looking so vibrant and lovely. Many times, I’ll end up creating an incredibly delicious yet completely revolting looking concoction. Today was different, thankfully. Haaaaave you met my friend cinnamon? Yup, cinnamon is one of my best friends, especially in the fall. Of course I love the flavor, but it’s what cinnamon does for me that keeps me coming back for more. Cinnamon regulates blood sugar, reduces LDL cholesterol levels, reduces arthritis pain, it’s an antibacterial, anti-inflammatory and antioxidant. It’s not just a latte topper anymore. Because of all of it’s lovely healthful qualities, I take it daily as well as give it to my children when cold and flu season comes around. A little sprinkle here, a pinch there and we are good to go. It’s wonderful for avoiding getting sick when everyone else around you is hacking up a lung and sneezing all over you. It is also fantastic if you have managed to catch what’s going around, to shorten the span of the sickness. Like I said a little goes a long way with cinnamon. No need to over do it. It’s wonderful in plain yogurt, since it adds a natural sweetness. I put it in my coffee and my kid’s oatmeal or grits in the morning. But I wouldn’t have more than a teaspoon a day. There’s really no need. Don’t even get me started on how awesome turmeric is. So, one day I was getting sick of drinking plain water and was also getting a little scratchiness in the throat. I decided to add some lime juice to get some vitamin C in me. 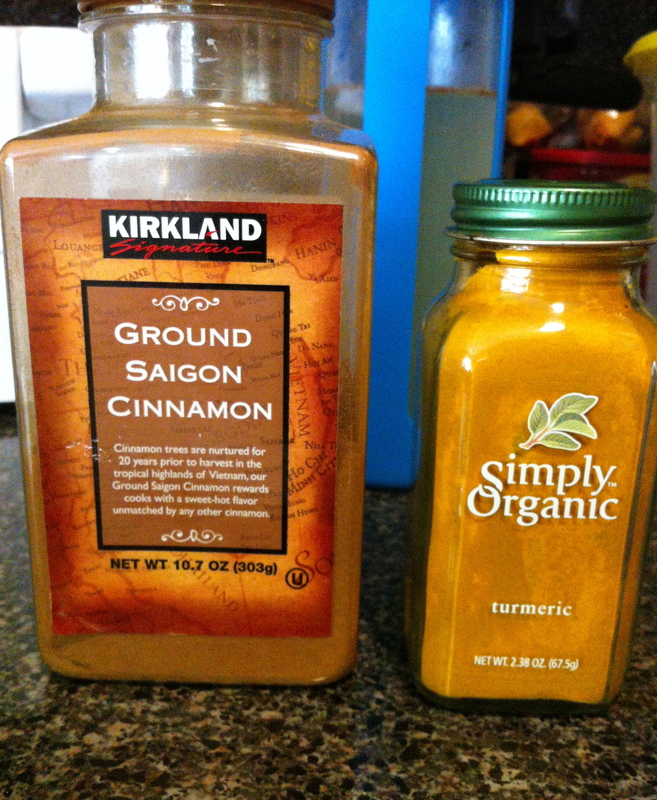 Then I thought, why not add a little cinnamon (2 shakes) to take the sour edge off? Then I was like, well I’m right here in the spice cabinet, why not throw in some turmeric (again, 2 shakes) and shut this cold down before it starts?! It totally worked and tasted great doing so. Now I try to have one of these a day. So far I’m feeling terrific and getting my autumn spice fix! My throat started feeling a bit sore yesterday afternoon and it’s been bothering me all day today as well. I have a week long camping trip that starts next weekend, so whatever it is, I want it gone! I’m pulling out the big guns to try to stop it before it turns in to a full blown cold. This is it. If this doesn’t help, I’m not sure what will. I will warn you, it’ll put hair on your chest. It’s not pretty, but it gets the job done. 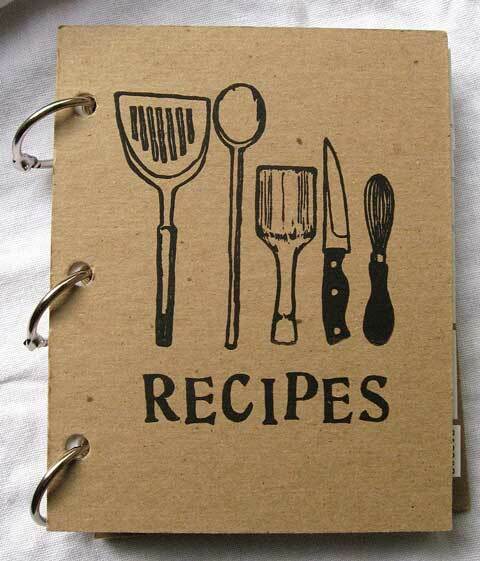 This is a recipe that I make in the summers when my son starts asking for lemonade. 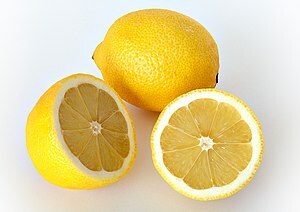 Sometimes I substitute limes for lemons, either way it’s not too sweet and very refreshing. 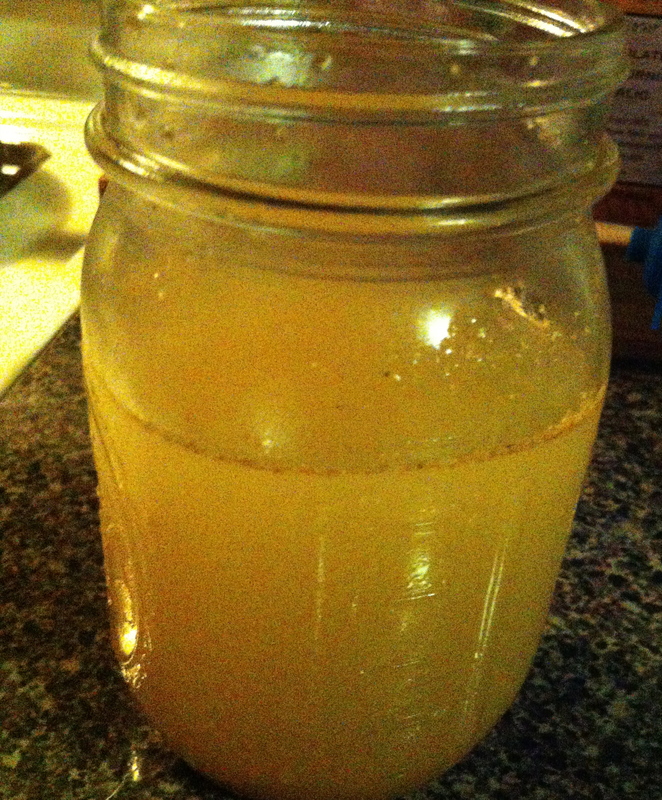 The raw honey and lemon boosts the immune system and helps greatly with seasonal allergies. You can add more or less apple juice to your liking.